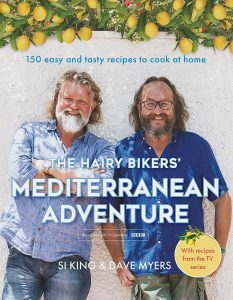 The Hairy Bikers, if you’re unfamiliar with the celebrity culinary duo, are not professional chefs, they don’t own any restaurants, they’re just a couple of hirsute motorcycle mates who love food and are passionate cooks. Somehow, thanks mainly to their down-to-earth charm and ‘everyman’ appeal, they have become a national institution. 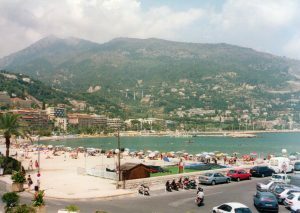 This book, like most of their other recipe books, is based on a television series – in this case, a trip around the Med that took in the South of France, Northern Spain, Southern Italy, Corsica and Sardinia. Quite a few of my favourite places, and favourite cuisines, as it happens, so I was always going to like this one. There’s something about the Med. The skies are unfeasibly blue. The sea is turquoise. The air zings with briny ozone. The cuisine radiates healthy eating. 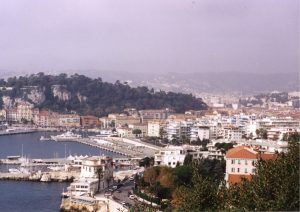 I adore the South of France in any season, and have eaten my way around most of it – and walked hundreds of kilometres of coastal paths and Grandes Randonnées (long distance footpaths). I’ve eaten the quintessential bouillabaisse in Vallon des Auffes, the little fishing port just outside Marseille, and the iconic Nicoise salad in (not surprisingly) Nice. 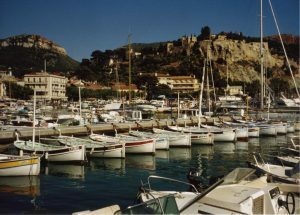 I’ve sampled endless Kirs in Cassis, and freshly hand-dived oursins (sea urchins) in Bandol – though I must admit, I preferred the local wine that was served with them. 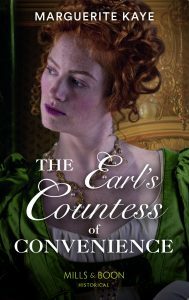 I’ve tried to capture the essence of the area myself, in The Soldier’s Dark Secret, when my French heroine returns to her native Provence near the end of the book, and in their own way, Si King and Dave Myers attempt to do the same, in this cook book. Why is this one of my favourites then, apart from the pictures and the nostalgia? For a start, the recipes are that unusual combination of straightforward, foolproof and tasty. You can cook everyday food from this book, or food for a special occasion. The ingredients are by-and-large easily obtained, and there are no complex ‘cheffy’ processes. The other acid test is, how often do I use it? The answer – a LOT! The book falls open at the tapenade recipe. Tapenade is the easiest thing in the world to make – just dump the ingredients into a blender and whizz. I always have a batch of it in the fridge. Yes, it’s very tasty with bread simply as an olive dip, which is what it’s meant to be, but it’s also an excellent flavour- enhancer. I put it in tuna pasta, in Bolognese sauce, and sometimes on pizza base. 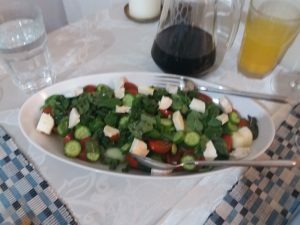 I discovered recently that it makes an excellent salad dressing when combined with the usual ingredients and some yoghurt, a bit like a Caesar but not quite so pungent. While the lads are not chefs, they are excellent bakers. 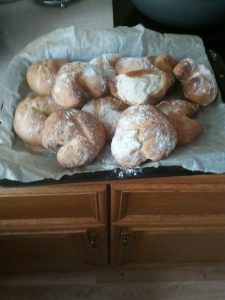 I’ve made the Fougasse, the little pataquetas (little crescent-shaped bread rolls), the orange and almond cake and the olive oil loaf – and all were delicious. 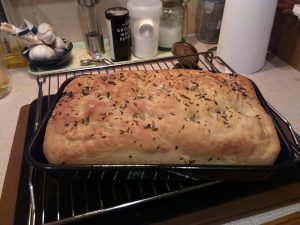 As for the focaccia – it’s the best one I’ve ever tried, even better than my previous go-to recipe from Hugh Fearnley-Whittingstall. I have attempted some of the mains – the Sicilian lamb (which I made with Bute lamb) was lovely – but for me the stand out recipes in this book are the starters, side-dishes and salads. I make a lot of minestrone soup, but the Hairy Bikers’ recipe for a Sardinian version took it to a whole other level – and it was green. 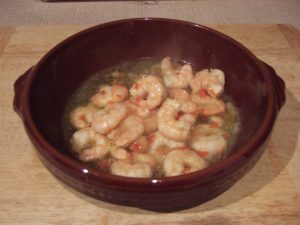 Garlic prawns, mushrooms with sherry, orange and fennel salad, courgette gratin, melon salad – my mouth is watering – I’ve made all of these more than once. As I said, simple, tasty and effective. If you’re looking for a healthy, tasty recipes to add to your culinary repertoire, I can heartily recommend this one. One word of warning though, while not overly expensive, the total cost is likely to include an impulse return airfare to the Med! 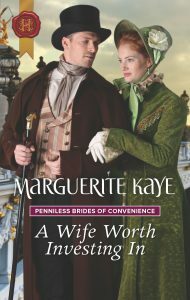 This entry was posted in Food and tagged Cookery Books, France, Hairy Bikers, The Soldier's Dark Secret. Bookmark the permalink.